Home > Happy Independance Day! Happy Independance Day! Go America! 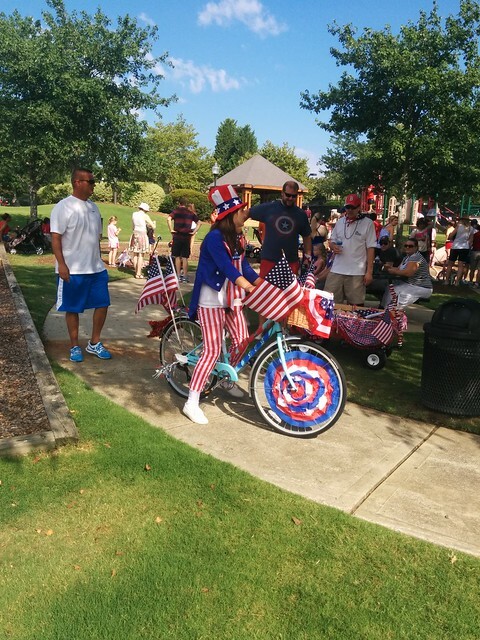 It was our very first 4th of July in Charlotte. It’s a difficult thing, leaving the Nation’s Capitol on holidays such as this one. No one does the 4th better than a DCist and no where does it harder than DC. We’ve had amazing 4ths in DC – from fireworks over the Potomac on a houseboat to standing in the middle of the National Mall, to watching fireworks from the top of an historic building at a fancy party, to watching fireworks from the top of the Union Station parking garage. With that in mind, we managed here – which just goes to show you that you can take the Marpepps out of DC, but you can never take the DC out of the Marpepps. We missed our little Barracks Row parade – our usual start in DC. But our neighborhood parade, while smaller, was adorable, and not without it’s high points (mainly, that we marched in it). At the end was a huge red-white-and-blue-blad playground playdate with dozens of the cutest kids, free beach balls, and amused parents hanging out on the sidelines. Not a bad start at all. In DC we make a run to Nats park for a game with a stop at Yard’s Park for the sprayground and wading pool, so we decided to do the same(ish) here. That decision was amplified by the fact that there would be fireworks after the game. 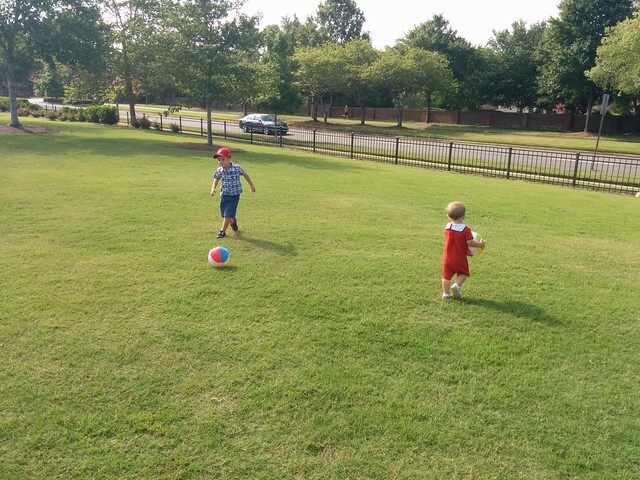 So we spent the afternoon grilling out and playing in the sprinklers – it’s no Yards Park, but the grilling and the personal bathrooms (and the no parking issues) were a positive. 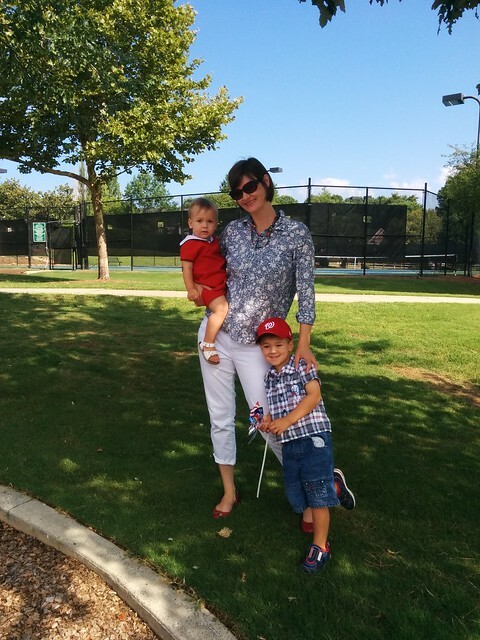 After a late nap, we headed downtown to partake in some 4th of July festivities and then hit the ball park. 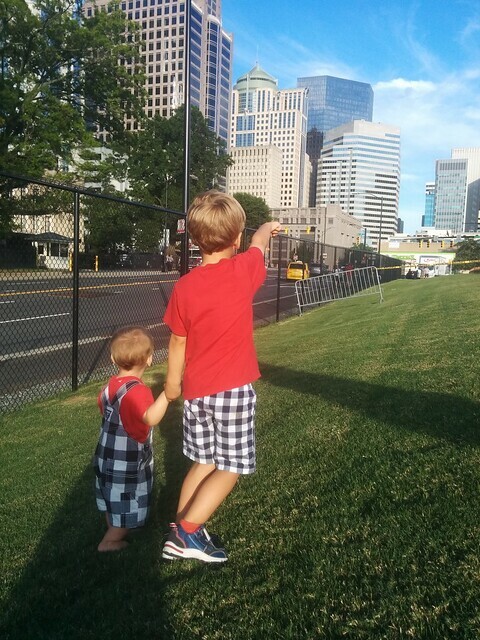 The nice thing about the Charlotte stadium is that there is a big grassy field for kids to run around with a fantastic view of the city. The awful thing about the Charlotte Knights stadium is that the view of the actual baseball field from said area is TERRIBLE. Just really really bad. So all the kids are running around, and the boys want to be with the kids, but you can’t see second base or most of first or really where the heck that ball went at all. 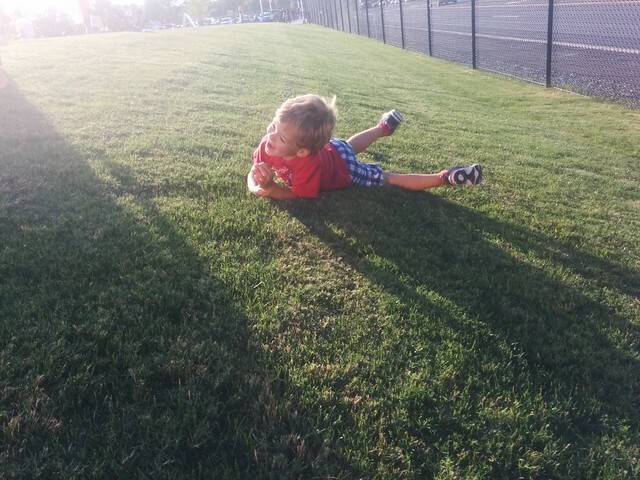 So we balanced it out with both watching the game and rolling repeatedly down the hill. And while the fireworks weren’t on the National Mall (that we walked to), they were fairly spectacular. Andy handled them like a champ with his gun-range headphones on. Getting home from downtown Charlotte on the 4th where there’s not other real fireworks option was slightly less than ideal, as in, it took us about an hour and a half (with Justin getting out at one point and angrily directing traffic). But it was certainly well-celebrated. Parade? Check. Ridiculous red, white, and blue outfits? Oh BIG check. Cook out? Check. Sprinklers? Check. Baseball game with mason jars of US beer? Check. Rolling down grassy hills? Double Triple check. Fireworks? Check. Looks like we did all the tasks listed in the Declaration of Independence. Isn’t that what it says? It’s been a while. 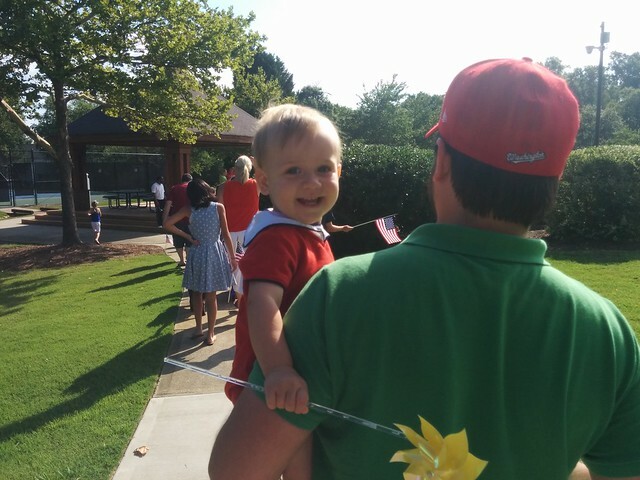 Either way, America has been properly celebrated by the Marpepps in our first Charlotte 4th. We hope you had a great one too!